Semi-finalist last year at the ITTF Challenge Series tournament in Croatia, Thailand’s Suthasini Sawettabut emerged the player to cause the biggest upset as matters commenced in the Women’s Singles event at the Seamaster 2018 ITTF World Tour Platinum Australian Open in Geelong on Thursday 26th July. Required to compete in the qualification tournament, she accounted for Chinese Taipei’s Cheng I-Ching, the no.5 seed, recovering from a two games to nil deficit to record a six games success (10-12, 6-11, 11-7, 13-11, 11-6, 11-8). Success for Suthasini Sawettabut but she was not alone in upsetting the odds and causing Chinese Taipei anguish. 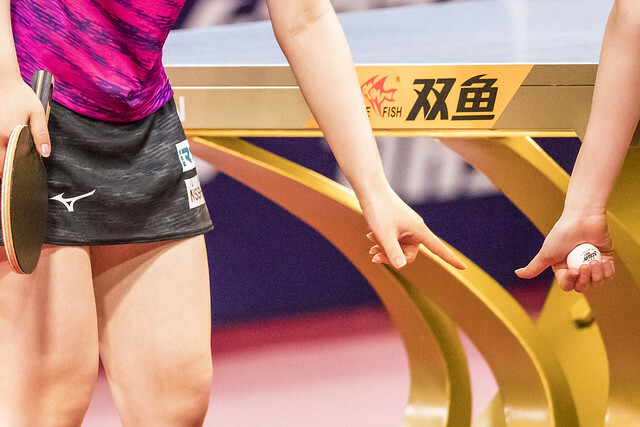 No doubt Yu Mengyu took advice from compatriot Feng Tianwei; the previous week at the Seamaster 2018 ITTF World Tour Platinum Shinan Korea Open, Miyu Kato had caused a major upset by beating Feng Tianwei, at the time the no.9 seed, in the opening round (11-6, 11-13, 11-7, 9-11, 11-6, 11-8). Two upsets, in the remaining contests as the first round of the Women’s Singles event advanced, the outcomes were as anticipated with China very much in evidence. Liu Shiwen and Gu Yuting both overcame Japanese opposition; He Zhuojia ended the hopes of the host nation. Liu Shiwen the no.2 seed, beat Marina Matsuzawa (11-8, 11-8, 11-9, 11-9), Gu Yuting defeated Satsuki Odo (11-5, 11-5, 11-6, 11-4); He Zhuojia overcame Jian Fang Lay, the no.16 seed (11-4, 11-5, 11-5, 11-6). Defeats for Japan and there was one more, Yui Hamamoto was beaten by Korea Republic’s Suh Hyowon, the no.9 seed (8-11, 11-4, 7-11, 11-3, 12-10, 11-6), the outcome reversing the decision of their most recent meeting in an ITTF World Tour event. In 2016 Yui Hamamoto had prevailed at the quarter-final stage in Austria. Matters not progressing in favour of the Land of the Rising Sun; however, there was a noteworthy successes; Kasumi Ishikawa, the top seed, emerged the winner in the all-Japanese duel. She beat Minami Ando (11-5, 7-11, 11-2, 9-11, 11-7, 11-4). Play in the remaining opening round Women’s Singles matches will be completed later in the day.